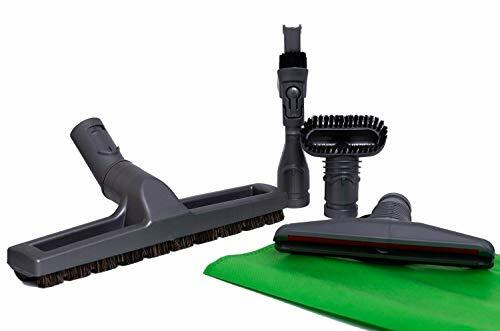 Green Label Attachment Tool Brush Kit for Dyson DC59 Animal V6 vacuum cleaners. Cleaning tool combinations are carefully selected. 1. 1.25 inch Horse Hair Bristle Brush with a 360 degree swivel neck that allows easy cleaning on any hard surface. 2. Mattress Tool Brush removes dust mites and allergens from mattresses and upholstery. 3. Stubborn Dirt Brush. Its stiff bristles remove mud and dried-in dirt. 4. 2-in-1 Combination Tool is debris nozzle which converts to a brush tool for dusting. It makes ultra quick adjustments on a wide range of surfaces including car seats and stairwells, soft furnishings, sofas, fabrics, stairs, book shelves, appliances, desk drawers, cupboards, cobwebs, corners etc. Fits the following models: DC59 Animal V6. This product is designed and manufactured by Green Label. This is not a Dyson OEM product and is not covered under any Dyson manufacturer's warranty. The Dyson brand names and logos are the registered trademarks of their respective owners. Any use of the Dyson brand name or model designation for this product is made solely for purposes of demonstrating compatibility. View More In Attachments & Brushes. If you have any questions about this product by Green Label, contact us by completing and submitting the form below. If you are looking for a specif part number, please include it with your message.